Question for welders: I'm assuming I should be trying to fill in every smaller void with new metal, even though there are no "holes" left - correct? Not really. 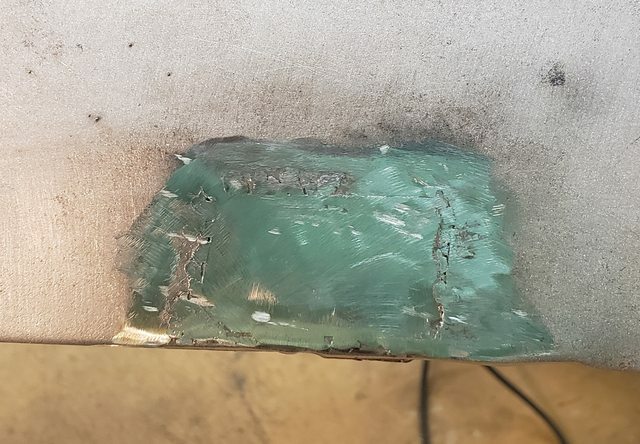 Repeated welding will increase the likelihood of distortion, and then you'll still have to grind those welds down, possibly excessively thinning the base metal. Those voids ultimately will be filled with primer-surfacer, or if too deep you can skim them with bondo. depends on what you want. its not hard to pattern a new patch in there but it will be time consuming and can warp. If you are sure you can get all the oil and rust and corrosion out of there you could try some kitty hair. I wouldnt personally weld over welds to fill it, as soon as you think you have it clean and put some filler on it you will find all the pinholes and junk in the welds and the filler will unstick. if it were mine I would cut it out and weld a new, larger patch. two bad patches wont ever make a good one, and I would be sure of my welds instead of counting on someone elses. Good advice, and I appreciate the input! Since I'm a newbie at sheet metal welding, I decided I'll use this as my practice piece and see what I'm able to do. I also found that I could buy an entire lower fender patch and just replace, so that's an option if I really butcher this thing. Had a little shop time last night and decided to try my hand at a patch panel. Covered the hole with packaging tape and then drew the outline on the tape. Then transferred the tape to my sheet metal. I could only get my hands on 22-gauge metal, which was probably a little thin and made it even harder to weld. Hopefully my copper backer comes in the mail tonight. I kept blowing through where there were larger gaps. It's not pretty, but it was good practice for me. I'm obviously not done yet, but that was all the time I had last night. I decided to start grinding around a PO patch that was raised up on the fender. Not sure "why", but a PO had spot-welded a square patch over a rust hole. Good for you cleaning up the PO work. Some of my stuff was a bit two steps forward one step back for me. Like you said, good practice lol. 1. turn the welder to the lowest heat setting and leave it there no matter how tempting it is to turn it up. 2. start with a high wire speed and tack a couple test spots, turning the speed down until the gun just barely doesnt push back on you. at that point you can almost lay into the weld, your tacks will sit flatter and look better. spend time fitting the parts, you can close bigger gaps with some practice but its easier to spend a little more time making sure you dont have a lot of gap between pieces. sometimes to let this happen I will shape the piece larger than it needs to be and then clamp it to the part I am repairing and use a thin cutoff wheel in a grinder to cut both the patch and piece being patched at the same time. when you start tacking, move around a bit, the metal will "pull" towards the tack which increases the gaps, if you spend too much time in one area you will have a hard time getting it back close enough to weld. glad to hear! its amazing that lowering the heat and turning up the speed is a cure, sounds counter intuitive. yeah 22 ga is a little thin when you are welding it to the 18ga of the fender. in that case I would start my weld on the thicker side and pull it to the thin. we are talking about maybe 2mm of movement, so it will take some practice, just imagine twisting the gun almost as soon as you start the tack. They earned my continued business for sure. Last edited by hobo; 04-16-2019 at 08:40 AM. torch welding is great but requires the setup, and then knowing how to setup. I had a little bottle setup years ago for cutting and got rid of it because the bottles were always empty in the middle of doing something. And the finished patch. Still learning, but getting better! The 18-gauge worked much better than the 22-gauge. Only a thousand more to go! Good start! Progress is progress, keep at it. that DOES look better! welding is no mystery, simply watch the weld! dont forget the clamp/cut both sides trick. get yourself a cordless 4.5 grinder and put a slicer blade in it. in a corded grinder slicer blades are dangerous, they have enough torque to shatter the blade when they get bound up, but the new crop of battery grinders (I use the 18v type) when the blade gets in a bind it just stops, no where near enough torque to explode into shrapnel. with enough practice you will get a mastery of it, wielding it like a surgeon uses a scalpel. Great advice on the grinder - Currently I'm using an air-powered die grinder with a 3" cutting wheel. I'll look at the cordless grinders.